Genießen Sie unser wunderschönes, authentisches Blockhaus aus den 50er Jahren an einer privaten Seefrontseite auf der ruhigen Seite von Silver Lake. Die Hütte ist mit Schätzen aus dem Familienbetrieb dekoriert und gemütlich und gemütlich. Sie verfügt über Holzböden, handgefertigte Holz-, Hickory- und Kiefernmöbel, ein Ledersofa und einen Sitz für Liebe und Ahornschränke. Die Küche ist hell und freundlich und ist gut mit allen Töpfen und Pfannen die Sie benötigen, einschließlich einer Kaffeemaschine ausgestattet. Der Essbereich verfügt über eine schöne handgemachte Hickory Tisch. Im Wohnzimmer ist ein Vermont Castings Gas-Herd mit Glasfront für die Abende, wenn Sie durch das Feuer sitzen möchten. Die Kabine mit ihren ursprünglichen Baumstämmen und Ritzen bietet Platz für bis zu sieben Personen. Die Schlafgelegenheiten sind: zwei Queen-Schlafzimmer, beide Betten sind mit Luxus-Matratzenbezüge und Bettzeug ausgestattet. Der Schlafraum mit Seeblick verfügt über neue Zeder-Etagenbetten für Erwachsene (das Etagenbett ist nicht klimatisiert) und ein Doppel-Rollbett. Alle Bettwäsche und Handtücher werden gestellt. Wir geben Ihnen einen Starter-Kit, das Papier liefert einige Papierhandtücher und Toilettenpapierrollen umfasst. Für den Angler, genießen Sie gute Angelmöglichkeiten. Bass, Sonnenbarsch, Barsch, Hecht, Sonnenbarsch und Zander. Es gibt einen See Terrasse mit Gartenmöbeln und einem Gasgrill zum Essen im Freien, wo Sie die spektakulären Sonnenuntergänge nach dem Abendessen genießen können. Es ist ein Sandstrand und Feuerstelle. Brennholz ist an mehreren Straßenständen oder auf dem nahe gelegenen Campingplatz erhältlich. Wir wissen, dass Sie Ihren Aufenthalt in unserem kleinen Schatz genießen werden. Internet, Direct TV, DVD, GasGrill, Tragbarer Kühler für das Boot. Haustiere erlaubt, Rauchverbot im Hallen DANKESCHÖN! Amazing vacation at a superb cabin! Our family of five (3 children 5 and under) had an outstanding vacation in the Traverse City area thanks to the exceptionally organized and clean cabin. The owners met us upon arrival and walked us through the property, showing us everything we needed to know. If needed, they were easy to contact for any questions while we were staying. The s'mores supplies provided were a thoughtful touch. The cabin was very clean and well organized; great to have starter paper supplies provided, clean/fresh linens, and comfortable beds! Kitchen was well stocked and cooking/grilling was a breeze. The fire pit, sand beach and dock were great for outside activities, as was the pontoon which was used everyday at the cabin. Our family loved taking boat rides around the lake and finding sandbars where we could swim! We also loved the proximity to Traverse City and the surrounding area activities. Sleeping Bear Dunes, Leenenau peninsula, and Old Mission peninsula are a must for families. This was our second trip to Traverse City and plan to come back again next year! My family and I had an amazing time staying in the cabin! It was so peaceful and is a beautiful property. Kurt and Emily met us there to show us around in the cabin. It was well stocked with all the little details. We loved having the pontoon boat to use at our convenience. We were on the lake everyday, I loved going on a boat ride in the evening. Our kids loved playing on the sandy area, and swimming in the lake. One of the best vacation rentals we've stayed at! We had a great week at the cabin! Our 2 boys loved the bunk beds, and we had a lot of fun out on the pontoon boat! Very comfortable cabin, and really close to Traverse City. Very Clean. Lovely owners who showed the well groomed property and the immaculately clean pontoon boat. Inside the cabin was a basket of s'mores ingredients for our family--very nice touch. I wish there was more than 1 bathroom for 5 people but we made it work. Great location on lake--very quiet. 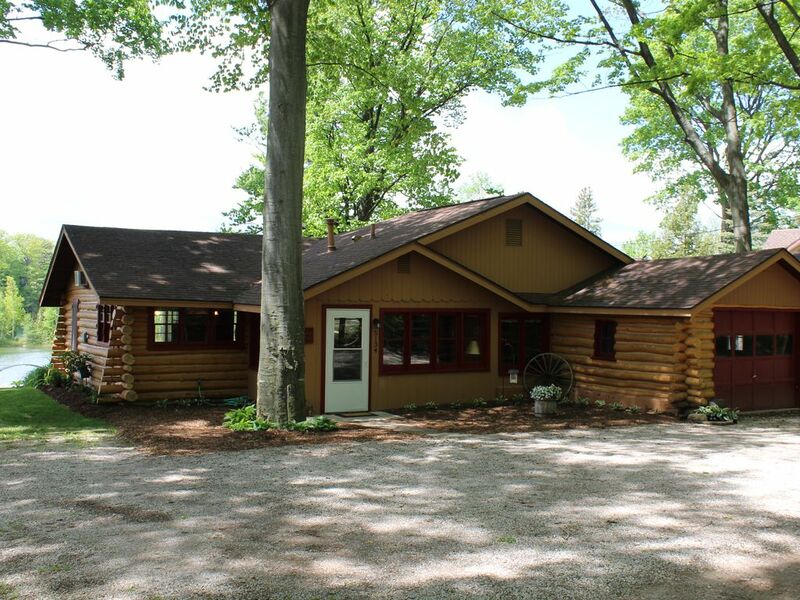 Great location in relation to Traverse City, Sleeping Bear Dunes, Mission Point Lighthouse, etc. We went to Moomers ice cream 4 times!!! Wonderful!! Drove to Mackinac Island- 2 hours away. We took chartered fishing boat from Traverse City. We recommend the General Store on the way to the lighthouse.. Definitely recommend. My family of 5 (kids 1, 11 and 14) and dog stayed here the 3rd week of June 2017. We were greeted in the very well maintained, clean cabin with music playing, fresh flowers, and a basket full of s'mores supplies for the fire. The kids and dog enjoyed swimming in the cove in front of the house and from the pontoon boat. The house is in a great location to take day trips while avoiding downtown TC traffic. We visited Suttons Bay, Northport, Leland, Crystal Mountain and of course Sleeping Bear Dunes. We also enjoyed ice cream, pie and shopping on Front Street in Traverse City. I would definitely rent this cabin again and highly recommend it! We stayed here the weekend before Memorial Day 2016. It's a super cute log cabin on a quiet, peaceful lake. Great porch off the back to drink coffee in the morning, nice fire pit, small sandy beach, clear water for view of the minnows. The cabin was clean, nice towels, comfortable for 5 adults and a baby. The beds were comfortable - I slept very soundly in the top bunk of the kids room and I'm a 40 something. Woke up to a great view of the lake everyone morning. The owner was very responsive and easy to work with. Everything went smooth which I appreciate when planning a vacation. The location is perfect for getting out to restaurants in Traverse City but coming back to the wilderness. Highly recommended! Interlochen Arts Academy (5 min), Einkaufszentrum Grand Traverse Mall (5 min), Shopping in der Innenstadt (10 min), Auswahl an vielen Restaurants (5 min), Sleeping Bear Dunes (45 min), Beach Bums Baseballstadion (2 min) Auch Kasinos und viele Weingüter in der Umgebung.